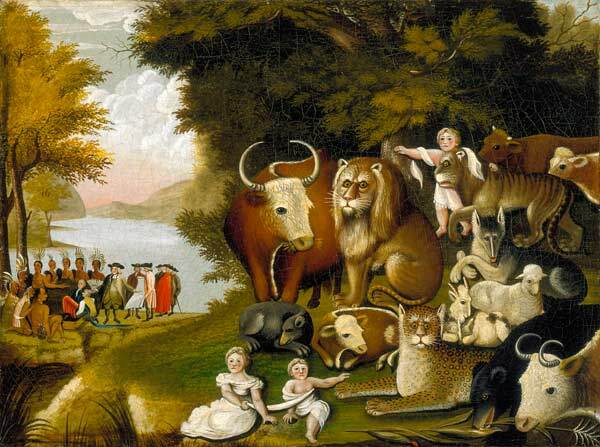 Trained as a sign, coach, and ornamental painter, Hicks painted over a hundred versions of his now-famous Peaceable Kingdom between 1820 and his death. His artistic endeavors provided modest support for his activities as a Quaker preacher in Bucks County, Pennsylvania. The theme of this painting, drawn from chapter 11 of Isaiah, was undoubtedly attractive to Hicks and fellow Quakers not only for its appealing imagery but also for its message of peace: "The wolf also shall dwell with the lamb, and the leopard shall lie down with the kid, and the calf and the young lion and fatling together; and a little child shall lead them." Into many versions, including the Worcester painting, Hicks incorporated a vignette of William Penn's treaty with the Indians, an image he adapted from a popular painting by Benjamin West (q.v.). Hicks may have viewed parallels in the two parts of the composition, inasmuch as Penn, who had introduced Quakerism into Pennsylvania, had also brought about a measure of the peaceable kingdom on earth.